Slow-twitch muscles fibers give us endurance, while fast-twitch fibers provide strength and power. Most of us have about the same amount of each type of muscle fiber. When he was two months old, my son Richie had a muscle biopsy that revealed an abundance of slow-twitch fibers, which explained the low muscle tone that was apparent when he was born. He was diagnosed with congenital fiber-type disproportion (CFTD) myopathy, a name that describes a cluster of genetic conditions that affect the balance of muscle fibers in the body. These conditions can range from mild to severe and can appear at birth or later in life. As any parent of a child with low muscle tone understands, what happens with the muscles affects other areas of the body. The heart, perhaps our most important muscle, can be compromised, as can posture, breathing and mobility. These are our daily challenges with Richie. I watched my little sister live with and eventually succumb to CFTD myopathy. Her experience with the condition was similar to my son’s, but not identical. The fact that I understood the potential progression of CFTD myopathy has been both helpful and frightening. For my sister Chavon, CFTD myopathy included a severe scoliosis that compromised her ability to breathe, along with multiple joint contractures that affected her mobility. Chavon was never able to walk or crawl, and her bones were fragile, resulting in several breaks over the years. Other issues like feeding difficulties, constipation and repeated bouts of pneumonia were part of her experience as well. CFTD myopathy comes with a tidal wave of problems that could affect Richie. Knowing the potential trajectory of this condition, we focus on riding the wave and addressing these problems as they come up, along with working to prevent the ones that haven’t rushed in yet. 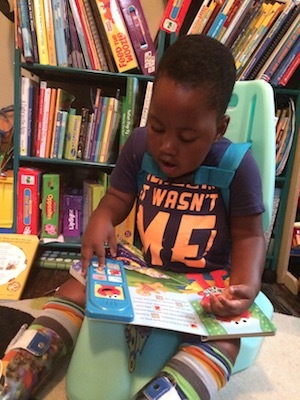 Occupational, speech and physical therapy have been part of his care since birth. Since he was six weeks old, he has worn back braces and casts to correct the curvature in his spine. He uses a stander for weight bearing in order to maintain his bone density and protect him from broken bones. Standing also supports his digestive health, as does his blenderized diet. Maintaining his respiratory health has always caused some rough waters, starting with the trach he had until a few months ago. Richie uses a cough assist machine and a percussion vest to support his respiratory health, and he has lots of orthopedic devices, like a crawl trainer and a swing, to get his body moving. Much of what we do with Richie has overlapping effects on his health and supports our goal to stave off the negative effects of CFTD myopathy. I use Pinterest as a resource to keep track of what works for us and to create wish lists for devices and activities that can help us along the way. We are trying our best to dodge the big waves and keep him at optimal health. We cannot prevent CFTD myopathy from affecting Richie’s life, but we can work with his doctors and other care providers to hold back the tide for as long as possible. So far, we’re hanging ten.